In radiometric density measurement, an isotope emits focussed gamma rays. 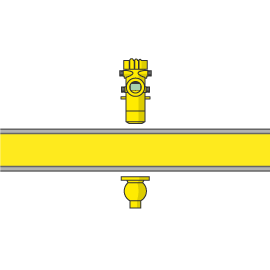 The detector on the opposite side of the pipeline receives the radiation. The scintillator of the detector converts the gamma radiation into signals, whose number is detected and evaluated. Because gamma rays are attenuated when penetrating matter, the detector can calculate the density or concentration on the basis of the change in intensity.